Evergreen Service Providers’ mission is to enable Individuals with Intellectual and Development Disabilities (IDD) to thrive both personally and within the community. 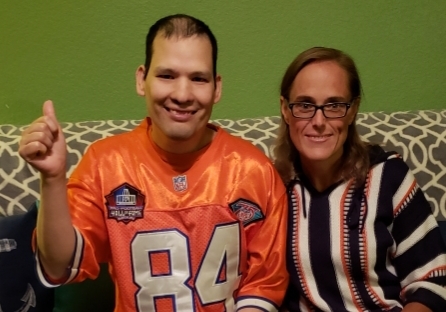 We could not fulfill this mission without our Host Home Providers – incredible human beings who open their hearts and homes to IDD Individuals, providing an environment of stability and dignity that fosters their lasting growth in mind, body, and spirit. We are blessed to work with many extraordinary Host Home Providers who have deep connections to those Individuals with whom they share their homes – connections that motivate compassionate dedication far beyond what their work requires. 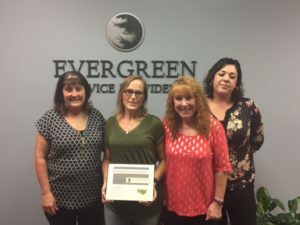 Evergreen Service Providers appreciates the opportunity to recognize these vital partners and their “above and beyond” commitment to IDD Individuals and our programs. We are delighted to introduce our “Host Home Provider of the Quarter” – Kris Bunch. Kris has been a Host Home Provider with Evergreen Service Providers for 24 years. Members of her extended family had been involved with Evergreen because of a family member who had special needs. During that period, a need arose for an emergency placement. Kris felt compelled to respond, followed her heart, and has never looked back. Kris’s understanding and insightful nature are immediately apparent. She exemplifies the kind of Host Home Provider we’d like to have more of! When Ruben came to live with Kris he was just a teenager. She was persistent in her efforts to gain Ruben’s trust. His family visited and provided support and Kris was keenly aware of maintaining a separate role from that of his family members. But one day, after several years with Kris, Ruben started referring to her as Mom-Mom, distinguishing her from his own mother but revealing the level of trust she had gained with him. Of this huge milestone, Kris says it is the most rewarding thing that has happened in her 24 years of working with Evergreen. Ruben, who is still with Kris, has progressed substantially with her compassionate support. Kris’s own son was born two years after Ruben came to be part of the family. They grew up together and both have grown because of it. Ruben learned social skills by interacting with his “brother’s” friends, and Kris’s son is an insightful, compassionate adult, still protective of Ruben. Kris attributes being a more patient and understanding parent to her experience with Ruben. In addition to Ruben, Kris is also a Host Home Provider for Dana who has been with her 15 years. Having lost her own mother at an early age, Kris has been able to help Dana navigate a similar situation, and treasures the experience of helping her find ways to cope and continue to feel close to her mom. Kris is quick to convey how much her experience as a Host Home Provider has enriched her own life. “I can’t say that I’d be the same person without them,” she reflected. “It’s good to know that I’ve done something positive. For me it just feels normal. It’s just who I am.” And so it is! Kris expressed that “You can’t take things for granted. You have to do what you can to help people out.” This lady walks the talk! Kris was honored with a certificate of appreciation as our Host Home Provider of the Quarter which cannot begin to express how much she is valued and admired. Thank you, Kris, for all your work, your compassion, and devotion to our mission – and, congratulations! Do you know one of our Host Home Providers who is going above and beyond? Let us know! We’d love to recognize them. To learn more about Evergreen and our services visit https://evergreenserviceproviders.com/about-us/.